July | 2015 | Can Men Cook? The Royal Oak, Prestbury, Glos. Just read the starters. Herring milts and king prawns. “Milts – erm, like the male equivalent of roe”. Not easy for the waiter! Scallops. Devon crab and prawn cocktail. Soup. Pigeon breast. And all a bit different. The pigeon breast was rare, pretty substantial and the salad dressed with a bit of lemon bite. The prawn and crab cocktail seemed quite substantial again, but had a lovely old fashioned feel, but with a modern twist. Everyone tucked in happily. Duck breast with pulled pork? Sounds daft? Worked splendidly! Grey mullet with 4 (I counted them) scallops. Mine also had roast new potatoes, green beans and tomatoes. The seared tuna steak had a smoky rub…and seemed to satisfy Mike who was sitting next to me. Chicken breast with an enticing sauce (Forest mushroom and Parmesan cheese), that was creamy and lemony. And, for our meat and two veg traditionalist…a beautifully simple sirloin steak and fat chips, triple cooked. The menu has a section called “Side Dishes – want any extras or sides?” Honestly – I would be surprised if you needed them. The dishes are all substantial. They obviously have hearty Yorkshire style appetites in Gloucestershire! As ever, eating well with lots of long term friends is always a great way of making the occasion good whatever you eat. But this pub, which has a lovely front of house staff, and a kitchen that loves its ingredients (and really doesn’t skimp at all) then the evening moves from great fun, to memorable. 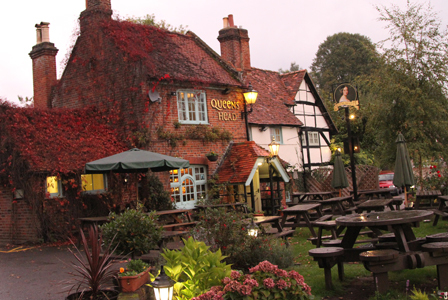 The Queens Head, Little Marlow. Yes. Can see why. Off the main road. Past another pub – always hard to do! But why did we go there? I learnt something today. Owner Daniel O’Sullivan said they had a quite full a la carte food menu when they started. Fine for the evening…but 70 people arrived for lunches – and only 20 ate. After 2 days they changed the lunch menu, to be lighter bites – check it out on their website . But isn’t that another great sign…”it’s not working – let’s change it”. We had the Rump Steak salad. Simple strips of fried slivers of steak – succulent, simple and tasty. It is easy to over or under do simple stuff. It was what is often described as ‘small plate’ – and that doesn’t mean small taste! So usefully filling for a lunch. It is true that many of us don’t really want a full 3 courses at lunch, especially as it is so hot at the moment. Having said that, the full a la carte menu is available if you so wish – sensible flexibility, I think! And the leaves, tomatoes and slivers or parmesan to accompany – and subtly dressed – yes, I love simple with a bit of passion added.